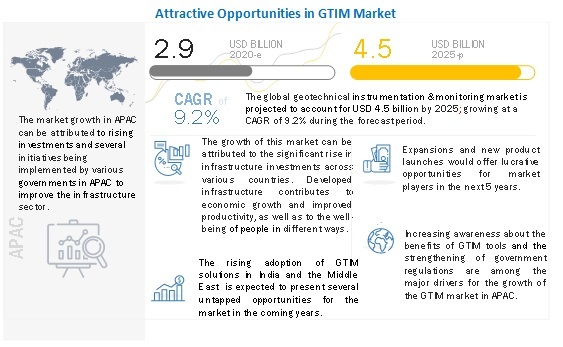 [175 Pages Report] The geotechnical instrumentation and monitoring market is estimated to grow at a CAGR of 11.37% from 2017 to 2022 to reach USD 4.64 Billion by 2022. This report provides a detailed analysis of geotechnical instrumentation and monitoring market based on offering, network technology, structure, end user, and region. The service segment, among offerings, is projected to grow at the highest CAGR between 2017 and 2022. 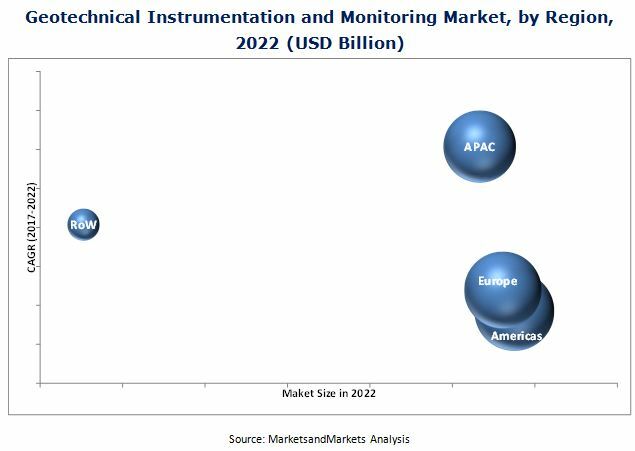 To estimate the size of geotechnical instrumentation and monitoring market, the top players and their share in this market have been considered. This research study involves the extensive use of secondary sources, such as the American Society of Civil Engineers (ASCE), the British Geotechnical Association (BGA), the IEEE Standards Association, the Australian Geomechanics Society, the International Journal of Geotechnical Engineering, a study of annual and financial reports of top players, presentations, press releases, journals, paid databases, and interviews with industry experts. After arriving at the overall market size, the total market has been split into several segments and subsegments and has been confirmed with key industry experts. The following figure depicts the breakdown of primaries conducted during the research study based on company, designation, and region. The geotechnical instrumentation and monitoring market includes component manufacturers, such as Geokon, Incorporated (U.S.), Geotechnical Instrumentation (South Africa), RST Instruments Ltd. (Canada), and Nova Metrix LLC (U.S.); and service providers such as Fugro N.V. (Netherlands), Geocomp Corp. (U.S.), Nova Metrix LLC (U.S.), Keller Group plc (U.K.), and COWI A/S (Denmark). This research report categorizes the overall geotechnical instrumentation and monitoring market based on offering, networking technology, structure, end user, and region. The geotechnical instrumentation and monitoring market is estimated to reach USD 4.64 Billion by 2022, growing at a CAGR of 11.37% between 2017 and 2022. The growth of the market is attributed to the increasing infrastructural investment across various countries all over the world, catastrophic failure of structures resulting in loss of lives, stringent environmental regulations pertaining to the sustainability of structures, and increasing awareness and superior benefits of geotechnical instrumentation and monitoring. The geotechnical instrumentation and monitoring market based on offering is classified into hardware & software and services. The services market is projected to grow at the highest rate between 2017 and 2022. The primary reason behind this growth is the demand for remote and real-time monitoring of critical structures, such as mines and tunnels & bridges. Of all the regions, the Americas held the largest market share in 2016. The major reason for this large market share is the high number of projects that are implementing geotechnical instrumentation and monitoring solutions in the region. The Americas has always been the leader in implementing this technology and is very particular about the safety of its structures. Some of the major restraining factors for the growth of the geotechnical instrumentation and monitoring market are the high installation cost and the slow adoption rate in emerging economies. Major players in the geotechnical instrumentation and monitoring market are Fugro N.V. (Netherlands), Keller Group plc (U.K.), Geokon, Incorporated (U.S.), Durham Geo Slope Indicator, Inc. (U.S.), Nova Metrix LLC (U.S.), Geocomp Corporation (U.S.), and Sisgeo Srl (Italy). These players have adopted various strategies, such as new product developments, partnerships and contracts, and business expansions to cater to the needs of end users in the geotechnical instrumentation and monitoring market. 13.14 DST Consulting Engineers Inc.